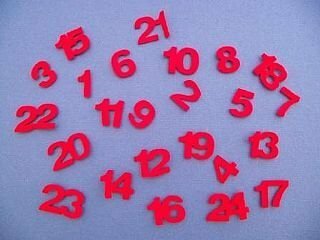 Mini felt numbers for Advent themed craft projects. The numbers are 14mm high. Supplied as six full sets. Numbered 1 to 24. Also includes one extra set free of charge just in case of any shortages etc. If you have any questions about this product by Crafty Capers, contact us by completing and submitting the form below. If you are looking for a specif part number, please include it with your message.